When you plan to design wedding dress, you may confuse to decide which model you like and of course, which color you’re gona wear? 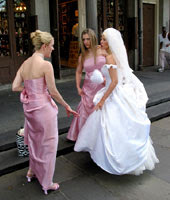 Not only for your wedding dress, but also for the bridemaid’s and the family’s dress. You have to be smart to match the dress color so it wouldn’t see too weird or contrast, and suitable with the whole theme of your wedding party. You should remember the top priority, what role are you play in that party? If you know it, this will be easier your job to decide which dress you’re gona wear. If you’re the parents who are the organized and the host of the party, choose a glamour and conspicuous color for the dress. You’ll be looks more ‘eye catching’ rather then the other guess. Color which often use for the parents is red, maroon, golden green, dark purple or lilac and gold. If you’re one of the relatives such as brother/sister or brother-sister in law, then choose color which is stronger to give an impress of luxury and stole their attention. Another option, you can choose softer color but combine it with beads and shining crystal, you’ll be very fantastic. Generally, it was good if the color of the bride’s parents and relatives are in the same color gradation or same color with the dominant color for the decoration in that room. This will be so influential when you take the family picture.